The body muscles of river lamprey, Lampetra fluviatilis, are built up of compartments consisting of one layer of tubular parietal (red) fibers surrounding one layer of platelike (white) “next to parietal” fibers, and the medial 1–3 layers of platelike central fibers. By morphometrical analysis of ultrathin sections, the content of mitochondria was 15% and 6% of the volume of parietal and central fibers, respectively, while the content of lipid in the same fibers was 10% and 0.7%. 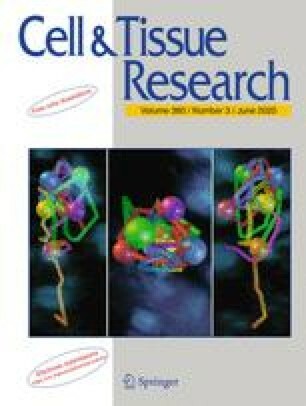 The volume of myofibrils was 69% of the parietal fiber volume and 80% of the central fiber volume. The sarcotubular system showed the values 6% and 13%, respectively. The “next to parietal” fiber layer showed statistically distinct intermediate values for all parameters. —The distribution of mitochondria was verified by a histochemical test for succinate dehydrogenase. The parietal fibers had the highest concentration of mitochondria laterally, decreasing to the middle of the fiber. The gradient was smaller in the “next to parietal” fibers, and less pronounced in the central fibers. In transverse sections of India ink injected muscle tissue, the fiber sizes were measured and capillaries counted in order to express the relation between the number of capillaries and the surface area of muscle fibers. —It is concluded that three morphological kinds of muscle fibers are present, which are probably dissimilar with respect to metabolism and function. The author is greatly indebted to Doc. Dr. med. Per R. Flood for his help and valuable examination of the work.